In addition to the above three volcanoes, a reading obtained from archangel Halaliel, mentions that volcanoes situated in Earth's torrid areas will erupt just prior to a "shifting of the poles." Thus, when more than the expected numbers of torrid-area volcanoes begin to erupt, their collective activity will indicate that a pole shift - predicted in Cayce reading 826-8 -- is to occur sometime by the end of 2001. When there is the first breaking up of some conditions in the South Sea (that's South Pacific, to be sure), and those as apparent in the sinking or rising of that that's almost opposite same, or in the Mediterranean, and the Aetna (Etna] area, then we may know it has begun. On pages 50-54 of my book, Coming Earth Changes (CEC) attention is given to recent sinking and rising of the crust in the Etna area, as reported by scientists up to 1996. This includes evidence that "both the volcano and northeastern Sicily have been uplifted 1.5 mm/year during Holocene times, although more recent rates of uplift may have been greater." (Firth, C., and Others, 1996, Geol. Soc. Spec. Pub, No. 110). Some commentators on the readings confuse Etna's recent spectacular eruptive activity of the past few years with "sinking or rising" in the Etna area. But while the recent magma pumping does cause the volcano to inflate (swell slightly) and to deflate temporarily, and while lava flows add somewhat to the elevation of Etna's slopes, these changes do not relate to the broader "Etna area" mentioned in the reading. Also, the wording of reading 311-8 seems to require that vertical crustal movements in the vicinity of Etna must become more obvious before we can truly say that significant Earth changes are imminent. Such accelerated sinking or rising of the crust in the immediate Etna area might soon be signaled by future eruptive phases that will surpass those of 1950, 1971, 1983, and 1991-1993. Volcanic activity during all of these previous times resulted in greater quantities of eruptive material than in 1932, the date of reading 311-8. And see subsection, "The Vesuvius," below for a better yardstick to assess the degree of "sinking or rising.... in the Mediterranean and Etna area" that we might need to observe before we can be certain that the historically unprecedented Earth changes predicted in Cayce's readings are indeed about to begin. As for "breaking up of some conditions in the South Pacific," mentioned in 311-8, two geologists have recently reported 1 that the Pacific tectonic plate is being torn "through the entire thickness of the ocean lithosphere" at the northern end of the Tonga Trench. The significance of the discovery of "breaking up" in this area -- being as it is "almost opposite" to the Mediterranean or Etna area -- is evident. Taken together with the small but accelerating crustal uplift in the Etna area cited above, it appears that we stand on the threshold of significant Earth changes. The purpose of one or the other of these indicator volcanoes is to provide a warning of impending earthquakes and "inundations" in California, Utah, and Nevada. If there are the greater activities in the Vesuvius, or Pelée, then the southern coast of California -- and the areas between Salt Lake and the southern portions of Nevada -- may expect, within three months following same, an inundation by the earthquakes. But these, as we find, are to be more in the Southern than in the Northern Hemisphere. Thus, we now have two ways of interpreting the "inundation-by-the-earthquakes" language of reading 270-35. And the ambiguity of the phraseology used seems to have allowed science to catch up to the reading, here near the end of the 40-year period (1958 to 1998) said to be prelude to catastrophic Earth changes between 1998 and 2998. As if to bolster our interpretation at this critical time, there is new global-scale seismic-tomography evidence for deep mantle circulation of unprecedented proportion. In 1998 we may find a great deal of the activities as have been wrought by the gradual changes that are coming about....[and] ....as has been indicated, we will begin to understand fully in '98". But first, just what are tsunamis? (The word is Japanese for tsu harbor + nami wave). A tsunami (pronounced tsoo-nah-mee) is a series of waves, generated in a body of water by an impulsive disturbance that vertically displaces ocean water. Sea-floor movements accompanying earthquakes are the most common cause of tsunamis. But landslides into the sea, submarine landslides, explosive submarine volcanic eruptions, and even meteorite impacts can generate tsunamis. Locally-generated tsunamis are the greatest threat to U.S. coastlines, but tsunamis originating at a distance are also a constant threat. The U.S. has suffered damage from tsunamis originating in Chile, Japan, Russia, and Alaska. Eventually, tsunamis will strike all U.S. Pacific Ocean coastlines. Because reading 270-35 above refers to tsunamis generated by local earthquakes, we will cite details for several here to give the reader an idea of historical numbers and effects. As covered in Tsunamis Affecting The West Coast of the United States: 1806-1992, 2the Santa Barbara tsunami of December 21, 1812, was most probably caused by a submarine landslide in the Santa Barbara basin. This landslide was believed due to an earthquake estimated at M7.7, and originating on the San Andreas Fault. The maximum wave height was about 15 feet or so, and is said to have reached half a mile inland. Submarine landslide tsunamis in California typically have waves with a maximum amplitude of 10 feet and affect a very restricted area. The tsunami of November 4, 1927, was such a one, and affected about 35 miles of shoreline. It was recorded as a six-foot wave at Surf, just north of Pt. Arguello near Santa Barbara, and as a five-foot surge at Port San Luis. Near Los Angeles, on July 10, 1855, four earthquakes generated a "probable submarine landslide and local tsunami." On May 27, 1862, an M5.9 earthquake at San Diego caused the only local tsunami observed there. On August 30, 1930, a M5.2 earthquake caused a 20-foot wave at Santa Monica, Venice, and Redondo Beach: "Probably a submarine landslide source given the low magnitude of the earthquake and localized effect. Sixteen people were rescued from the surf. One drowned at Redondo Beach." These few representative records show that local tsunami inundations "by [the] earthquakes" are quite possible for the southern coast of California. In all, some 21 locally generated tsunamis of various destructive power have been documented for the southern California coast between 1806 and 1992. Although this coast seems safe from locally generated tsunamis relative to the coasts of, say, Japan or Alaska, the dangers from large tsunamis cannot be ignored. D. S. McCullough, in a U.S. Geological Survey report on tsunamis along the Pacific coast, says that "a preliminary appraisal of the potential for locally generated tsunamis suggests that wave run-up heights as great as four to six meters," or 13 to 20 feet, could be caused by seabed movements due to earthquakes. Such waves are not in the same league with the giant tsunamis that hit Hawaii in 1946 and 1975, but even a five- or six-foot tsunami can cause widespread damage in a harbor or along a heavily settled stretch of coastline. One tsunami-prone area in southern California is located off Santa Barbara where the offshore area has created an odd set of conditions with the potential for making large seismic sea waves. Quoting a report on southern California's tsunami potential, D. Ritchie says in his book Superquake! (Crown, NY, 1988), "'Surface fault rupture accompanied by sea-floor displacement is a distinct possibility beneath the Santa Barbara Channel. To put it another way, a big quake on land could set off another quake under the sea and thus send tsunamis rolling toward the California shore." Support for this view is found in J. Deng and L. Sykes's recent study of the 200-year evolution of the crustal stress field in southern California (Jour. Geophysical Research, v. 102, B5, May 10, 1997). The authors write: "Future great earthquakes along the San Andreas Fault, especially if the San Bernardino and Coachella Valley segments rupture together, can trigger moderate to large earthquakes in the Transverse Ranges, as appears to have happened in the Santa Barbara earthquake that occurred 13 days after the great San Andreas shock of 1812." If the ultimate cause of the tsunamis mentioned in our speculation on the meaning of 270-35 above is an acceleration of lithospheric plate movements incident to pole shift, there is one last, far-out possibility to consider. And it ties into the last sentence of the reading, which indicates that the effects of the inundations by the earthquakes will be felt more in the southern hemisphere. This understanding of the phrase "inundations by the earthquakes" would relate to tsunamis generated from distant sources. If a huge piece of the Kilauea volcano, on the island of Hawaii, suddenly slides into the Pacific, highly energetic tsunamis would be generated that would strongly impact the southern California shoreline and those of Central and South America. Indeed, the coast of southern California has experienced no less than 44 tsunamis generated by earthquakes or submarine landslides beyond the U.S. Pacific coast (excluding Alaska) between 1806 and 1992. These waves have traveled from Japan, coastal Alaska, Chile, the Kuril Islands, the Java Sea, El Salvador, and other places. Many of the 44 tsunamis of distant origin that hit the coast of southern California were recorded only as minor excursions on tide-gage records. But consider what could happen as accelerating mantle motions cause earthquakes and landslides at currently erupting Kilaeua. (The seismic hazard for the southern portion of Hawaii rivals that of the area around the San Andreas Fault in California, according to F. Klein, seismologist with the U. S. Geological Survey. And geophysicists in early 1997 were measuring progressive seaward displacements of the land portion of Kilauea's southeastern flank). In their study, "Giant Hawaiian Landslides" (Annual Reviews of Earth and Planetary Science, 1994), J. Moore, and others, document dozens of major landslides that have recently been discovered on the flanks of the Hawaiian Ridge. They are among the largest on Earth, attaining lengths greater than 200 km and volumes of several thousand cubic kilometers." The authors write that rapid movement of some of the submarine debris avalanches "is indicated by the fact that some have moved uphill for tens of kilometers, and are believed to have produced major tsunamis." To return to the main topic of this article, just what "greater activities" means involves a somewhat subjective judgment. Greater than what other activities? When the reading was given in 1936, Vesuvius had been erupting intermittently for 23 years (since 1913). It continued to do so until 1944. Apparently, eruptions between 1936 and 1944 were not sufficient to qualify as "greater activities," because the "inundation by the earthquakes" did not occur. Volcanic activity during the 1936-1944 period was generally confined to the summit and upper slopes of Vesuvius. Thus, "greater activities" at Mt. Vesuvius will be interpreted here to mean the occurrence of more vigorous and widespread eruptions than those that occurred between 1913 and 1944. Such stronger eruptions will presumably reflect the beginning of worldwide movements in the mantle and overlying lithospheric plates, associated with the beginning of a shift in the poles predicted for 2000 - 2001. A. When there is a shifting of the poles, or a new cycle begins. Mt. Vesuvius, located on the outskirts of Naples, Italy, last erupted in 1944. Nothing special is going on at this indicator volcano, or in its immediate area, at the present time. Mt. Vesuvius is a cone-shaped edifice built within a very old caldera 3, Mt. Somma. The 18,000-year-old Mt. Somma caldera lies just east of another ancient caldera, Campi Flegrei. Thus, "the Vesuvius [realm?]" of the above reading comprises a highly volcanic portion of the Earth's crust. Treated on pages 267-268 of CEC is the possibility that Gladys Davis, Edgar Cayce's stenographer for reading 270-35, might not have known that Cayce's source could have meant "Pele," instead of Pelée. Pele could be interpreted to stand for the domain of the Polynesian fire goddess Pele, who is believed to inhabit the crater of Kilauea volcano on the island of Hawaii. Inspection of the original copy of reading 270-35 indicates that Mr. Cayce did not spell out either Pelée or Pele when giving his reading. Thus, perhaps Cayce's source did not mean Mt. Pelée, on the island of Martinique. Here we have only a slight difference in pronunciation, and just one letter "e" between the two names. Also, there is the unusual placement of the article the in, "If there are the greater activities in the Vesuvius, or Pelée....." It seems as though a noun like "areas" or "realms" has been omitted after the word Pelée. Thus, something like "....greater activities in the Vesuvius or Pele realms or areas....." might have been intended by the source of Cayce's reading. At any rate, there is an outside chance that Miss Davis might have written Pelée, where Pele was actually intended. Thus, we will consider "greater [volcanic] activities" at both Mt. Pelée on Martinique, and at Kilauea, in Pele's realm on the Big Island of Hawaii, as potential indicators of forthcoming "inundations by the earthquakes" in Utah, Nevada, and coastal southern California. What do we know about the history and current eruptive status of the volcanoes Pelée and Kilauea? The last eruptive phase of Mt. Pelée began in 1929, and ended in 1932. The reading that refers to "greater activities" was given in 1936. During the 1929-1932 period, Pelée exhibited explosive activity, produced pyroclastic and mud flows, and developed a dome and spine. No lives were lost. This level of activity contrasts markedly with the previous activity of 1902-1905. That eruptive phase began in May 1902, when Pelée suddenly erupted, spewing out masses of lava, pumice, and hot ash from the south side of its 4,600 ft. edifice. In one day, 30,000 people died. The volcano has been dormant since 1932. Whether or not reading 270-35 was referring to "greater activities" in the realm of Pele, there is a consistent logic for Vesuvius, Pelée, or Pele's Kilauea being indicator volcanoes for the beginning of significant Earth changes. This is so because each of the three volcanoes can be expected to be sensitive to movements of magma that will occur in conjunction with accelerated movements of Earth's lithospheric plates, upheavals in the Arctic and Antarctic, and eruptions of torrid-area volcanoes. These events are predicted to take place just prior to a shifting of the poles in the year 2000. Note that both Pelée and Kilauea are torrid-area volcanoes, located as they are in Earth's Torrid Zone between the Tropics of Capricorn and Cancer. "Upheavals in the Arctic and Antarctic" may turn out to be mostly volcanic in nature, and not due to simple upthrusting of crustal blocks. Periods of flood-basalt volcanism can develop impressive lava plateaus. One such lava upheaval, in Siberia 250 million years ago, has recently been determined 4 to have risen from a depth of 1,800 miles. This lava originated in the super-hot zone near the Earth's core-mantle boundary. Reading 5748-6 said that "upheavals in the interior of the Earth" would begin in 1936. If these upheavals were also superheated plumes of buoyant plastic rock in the upper mantle, they could easily have taken 64 years until now (2000) to push overlying mantle rock to just below Earth's surface in the Arctic and Antarctic areas. The kinds of upheavals that reading 3976-15 predicted would occur in the polar zones seem well represented by the great (M8.2) Balleny Sea earthquake/upheaval of March 1998 in the Antarctica area, and in 1999 by the more than 200 earthquakes and inferred volcanic activity in the high Arctic in 1998-1999. C. Müller and W. Jokat (EOS, June 13, 2000, p. 265) state that "The detection of this earthquake swarm and the evidence for its volcanic origin is the first direct evidence of recent volcanic activity in the high Arctic;" that is, of upheavals in a portion of the Arctic close to the North pole. 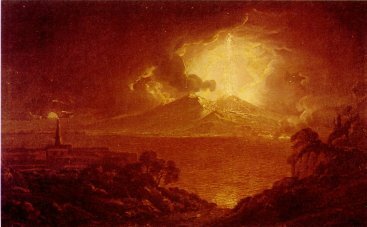 How can we discriminate between normal on-going eruptions of volcanoes in the torrid areas, and the increase in eruptions of such volcanoes as predicted in reading 3976 above? Are there more eruptions of torrid-area volcanoes in 1998 than in earlier years? Has anyone looked carefully for such evidence? 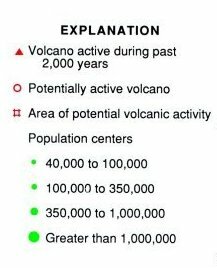 The book, Volcanoes of the World,5 deals briefly (p. 29) with what is known about the magnitude and frequency of worldwide volcano eruptions. To begin, the larger eruptions have taken place at a reasonably constant rate of nearly one per year for most of the last 200 years, and "all eruptions have averaged about 60 per year for the last 20-30 years." Thus, if we begin to see more than about 60 eruptions per year worldwide, and many more than the usual number of these are in the torrid areas, then we will have confirmation of the reading in question. (Note that the term "torrid areas" in reading 3976-15 describes a less rigorously defined strip of global territory than does Torrid Zone; that is, torrid areas may extend somewhat to the north of the Tropic of Cancer and to the south of the Tropic of Capricorn, while by definition, the Torrid Zone must lie within two parallels, each 23.5 from the equator). 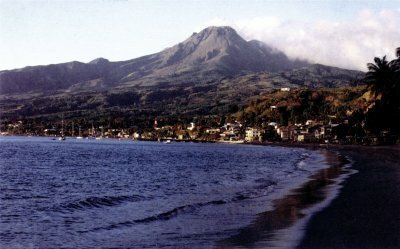 The recent eruption of Soufriere Hills volcano on Montserrat in July 1995 is an example of an unexpected eruption of a torrid-area volcano. 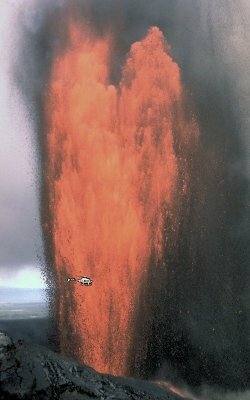 Kilauea, on the island of Hawaii has been in essentially continuous eruption since 1983. Remember also that chronological records of deep-sea rift eruptions are virtually unknown. But volumetrically, lava pouring from such rifts constitutes the dominant form of global volcanism. Interesting, too, that the most active area for this type of globally-dominant volcanism lies on the East Pacific Rise, in a torrid area. Historical records reveal only a few concentrations of volcanic eruptions in specific areas. The most interesting concentration that relates to the Cayce readings is described in Volcanoes of the World (p. 30). 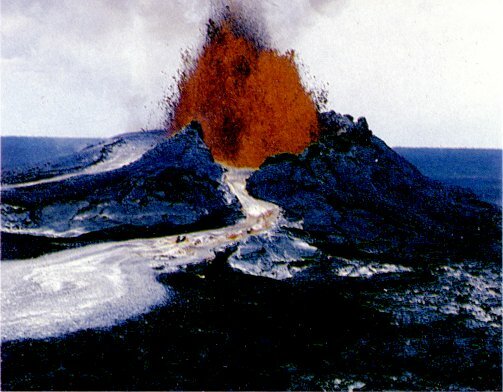 The famous 1902 eruption of Mount Pelée was preceded, only one day earlier, by an equally explosive eruption on St. Vincent, 165 km to the south and much too far away to consider subsurface plumbing connections. These were followed five months later by an even larger eruption of Guatemala's Santa Maria, 3260 km to the west on the opposite side of the Caribbean Plate. In no other year have three explosive eruptions of this magnitude been recorded, and it is tempting to link them to plate tectonic movement. Now, near-simultaneous eruptions of volcanoes on opposite sides of the Caribbean lithospheric plate (Fig. 5, CEC) do not necessarily equate to the possibility of concentrated eruptions of volcanoes in the Earth's torrid areas. But the Caribbean-plate example seems to provide a hint of what might be possible should movement of Earth's plates suddenly accelerate. Will only torrid-area volcanic activity increase in the days ahead? It would seem that if "the Earth will be broken up in the western portion of America.... [and]....the early portion [of the Earth-change period] will see a change in the physical aspect of the west coast of America (3976-15), then the American West will be impacted not only by earthquakes and upheavals, but by increasing volcanic eruptions as well. Reviewed below is historical information for potentially dangerous Western volcanoes. The USGS estimates of volcano impacts are also given to show what a geologically sudden and thoroughgoing breakup of the American West might do to volcano eruptivity over the coming 12 months. Volcanoes of the Cascade Range extend from Mount Baker, WA, on the north to Mount Lassen, CA, on the south. They erupt far less frequently than Kilauea, but they are more dangerous because of their violently explosive behavior and their proximity to populated and cultivated areas in Washington, Oregon, and California. Historical records show that only two eruptions disturbed the quiet of the Cascades in the 90 years prior to the 1980 eruption of Mt. St. Helens. But between 1832 and 1880, four of the northern Cascade volcanoes (Baker, Hood, Rainier, and St. Helens) erupted lava or ash over periods of one to three decades. Many of the Cascade volcanoes could erupt as part of the breaking-up of the western portion of America. This could begin as a result of a giant (M9.0+) quake along the Cascadian subduction zone. Mt. St. Helens. On May 18, 1980, this volcano provided the largest Cascade eruption in historic time when the north side of its summit crater was blown apart. The most recent eruption of lava from its dome occurred on October 21, 1986. In early 1998, earthquake activity beneath St. Helens gradually increased over several months and accelerated into June. None of 1998's many minor quakes are of the low-frequency type that typically lead to major eruptions, although it's possible that they reflect increased magma pressure at depth that eventually may lead to renewed activity. But we must remember that Cascade volcanoes can erupt suddenly. In 1980, Mt. St. Helens took only two months from the time of the first earthquake to its peak eruption. Mt. Baker. After Mt. St. Helens, Mt. Baker is the most active Cascades volcano. Beginning in 1975, rates of steam emission from Baker's Sherman cone increased suddenly to 10 to 100 times its normal rate, and then subsided gradually. This volcano has a history of pyroclastic and mud flows. If melted during an eruption, its 20 square miles of active glaciers could produce dangerous floods. Mt. Rainier. Ancient mudflows from this 13,000-foot volcano coursed through many of the locales where people of Seattle and Tacoma live today. Although observers logged 16 eruptions of Rainier between 1820 and 1894, it shows few signs of activity at present. Summit craters are hot, however, and if Rainier were to erupt from these craters, dangerous mudflows and floods could occur. A giant quake in the Cascadia subduction zone could cause Rainier to erupt a few days later. Mud and debris flows would probably start before the eruption, bringing the potential for annihilation of thousands of people. Crater Lake. This caldera formed 6,850 years ago during the eruption of Mt. Mazama. At the climax of that eruption, ash blanketed nearly all of the Pacific Northwest. Assessment of potential volcanic hazards will depend upon data on the current state of its magma chamber, but the USGS lists it as a potentially active volcano. Currently dormant, the next eruptions are most likely to occur only inside the caldera. Mt. Hood. Between 400 and 600 years ago, Mt. Hood sent pyroclastic and mud flows down its slopes. It last erupted in 1859 or 1865, and could erupt again in the near future. Almost 100 small quakes were detected in February 1998 beneath Mt. Hood's south flank. The USGS says that "intermittent earthquake swarms and discrete events seem to characterize Mt. Hood's "normal" level of seismic activity," but that any departure should be closely watched as it could indicate renewed volcanic activity. Lassen Peak. A series of spectacular eruptions occurred at Lassen Peak between 1914 and 1915, making it California's most recently active volcano. A pyroclastic flow on May 21, 1915, devastated forests four miles away. The volcano has been inactive since 1921. Mt. Shasta. Although Mt. Shasta has not erupted since 1786, it has the potential for eruptions, which produce pyroclastic flows that move down the mountain at high speeds. An eruption of Mt. Shasta also could be expected to produce mudflows and huge floods during melting of the snow that covers its peak. Others. Cascade volcanoes that erupt less frequently than every 1000 years, and which last erupted more than 1000 years ago, include Three Sisters, Newberry, Medicine Lake, Glacier Peak, Mt. Adams, and Mt. Jefferson. Three of these, Three Sisters, Newberry, and Medicine Lake have also evolved into the range of hazardous magma composition (high in silica and gas).. South Sister seems to be the most dangerous of the Three Sisters. Long Valley Caldera and the Mono-Inyo Craters. These features represent the greatest immediate volcanic hazard in the lower 48 states of the U. S. mainland. And the Mono Lake - Long valley region is California's potentially most dangerous volcanic field. As covered in CEC (p. 43), Long Valley last erupted 250 years ago. Over the last few years, Long Valley caldera has witnessed swarms of earthquakes, a rising dome of hot magma, and releases of carbon dioxide gas. The enormous eruption of the original volcano, some 700,000 years ago, expelled huge quantities of incandescent ash. The Mono-Inyo Craters lying just to the north of Long Valley erupted in 1350, producing widespread ash falls over central California and western Nevada and thick lava streams that, if repeated today, would disrupt communities all along U.S. 395, between Bishop and Bridgeport. These craters are of concern because they seem to overlie a magma chamber that has reached a dangerous point in the evolution of its chemical composition. 7 And they erupt about every 200-300 years. Some part of the crater chain could erupt explosively at any time, although monitoring indicates that an eruption is not imminent. Yellowstone Caldera. This caldera erupted explosively three times in the last two million years, producing some of the greatest eruptions in Earth's history. Its ash deposits have been found in Kansas, Saskatchewan, and California. If it were to erupt again today -- in response to accelerated movement of Earth's plates -- it might repeat the last eruption that ejected at least 250 cubic miles of new magma. Damage to crops and population centers would be extensive in the West, and much of the rest of the country would be shut down. If the American West is "broken up" in 2001, we may presume that at least some of the volcanoes discussed in the above section will reawaken and erupt. Intensity levels of such volcanic eruptions are impossible to estimate. As a minimum, however, we might expect the occurrence of some severe impacts, but not necessarily in all places at once. 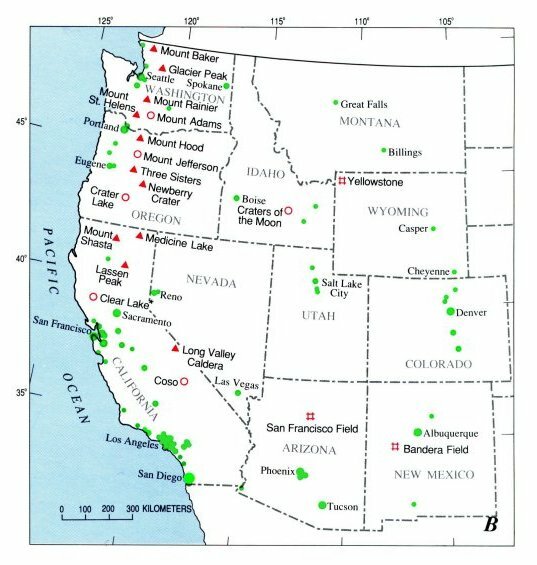 A repeat of the past catastrophic eruptions at Yellowstone and Long Valley, however, would affect much of the western U. S. and produce significant disturbances to agriculture and transportation in the central and perhaps eastern United States as well. D. Millen and M. Hamburger, 1998, Geology, p. 659-662. Some material in this section is extracted from Brantley, S.R., 1995, Volcanoes of the United States, (U. S. Geological Survey pamphlet 0-164-937), and from Harris, S.L., 1988, Fire Mountains of the West, Mountain Press, Missoula, MT, 50806. Kerr, R., 1983, Science, v. 221, p. 634.